We've spotted some gorgeous projects woven with our yarns in recent years; one of our all-time favorites is the Outlandish Tartan Scarf in Lhasa Wilderness, which is an excellent yarn choice for weaving due to the strength of the bamboo fiber in this yak and bamboo blend. While the Tartan scarf example linked above is stunning, newer weavers may find it a bit daunting - but don't worry! Beautiful results can be achieved with more basic techniques such as plain weave, just by varying the yarns used for the warp and weft. The warp is simply the yarns that are held under tension on your looms - think of them as the foundation upon which you'll build your project. The weft refers to the yarns you use to pass through the warp. Weaving has special challenges that can strain a short stapled fiber such as yak, bison, cashmere or qiviut - but it doesn't mean that you can't weave with it! As warp yarn is subjected to a lot of tension, it's important to use a yarn that blends yak with a longer stapled fiber such as silk, bamboo, nylon, etc. When it comes to weft, your menu of options widens to just about anything your heart desires! On the whole, yak is a very durable fiber that holds up well for all fiber arts; yak yarn and weaving can actually work quite well together! Shangri-La (yak/silk), Lhasa Wilderness (yak/bamboo) and Tibetan Dream (Yak, nylon) are all excellent yarn choices which have been very popular in weaving circles for quite some time. While there are many ways you can experiment with hand-dyed colors in your weaving project, here are a few ideas to get you started! In the sample swatch pictured at left, we've used Laoghaire for both the warp and weft. In the sample swatch pictured at left, we've used Coastal Breeze for the warp and a semi-solid for the weft (we recommend trying Deep Teal or Azure). In the sample swatch pictured at left, we've used Joseph for both the warp and weft. In the sample swatch pictured at left, we've used Laoghaire for the warp and a variegated color way for the weft. 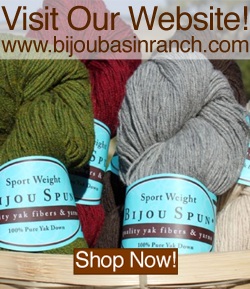 Bijou Basin Ranch will be attending the Intermountain Weavers Conference in Durango, CO this July 27-30, 2017, and we're excited to share more weaving inspiration & tips with you between now and then! 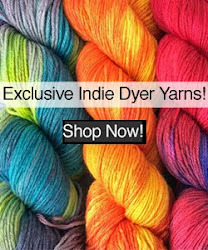 Great post regarding "Weaving with Hand-Dyed Yarns"
Your post is wonderful and great.